What is a bare root nursery? 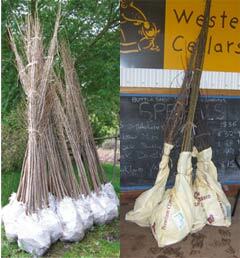 In a bare root nursery trees are grown in the open ground rather than in containers. They are lifted for transplanting during the winter when they are dormant. 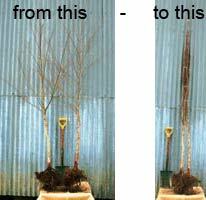 Successful establishment rates are very high provided the trees are handled properly during transplanting and subsequent growth is usually superior to that of containerised plants. 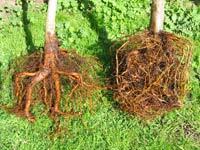 Bareroot trees develop a structured root system that is closer to natural than the tangled mass of fine roots that are found in pots. Dormant trees are easier to transport and plant out than heavy pots They will compact down into surprisingly small bundles. The key to successful transplanting is to protect the root system from drying out unduly by taking reasonable care to keep it cool, moist and out of any wind. Whilst the root’s surfaces should ideally be kept moist at all times a degree of tolerance exists, but extra care taken – the “one percenters” can help to improve results. keep the roots well wetted during this period and within reason out of the sun and the wind. When transporting trees on open utilities or trailers it is important to wrap them in windproof tarpaulins as well to reduce drying and to rewet the roots upon arrival. If the trees are to be kept for any length of time they should be “heeled in” with the roots being temporarily covered with damp sand, soil, potting mix, compost or other materials which protect the roots from drying out. The less air pockets the better the protection. 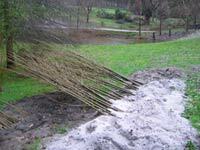 Bareroot trees can be safely stored for weeks in this way during their dormant period. We can provide temporary protection of roots during transport by placing damp shredded paper around the roots and wrapping the whole with shrinkwrap. Protection is for days rather than weeks and the planting becomes a little messy with paper and plastic. Trees despatched by courier are packaged in this manner. Cost is $2 per tree/$5 bundle.